At MD Advanced Skincare our non-surgical rhinoplasty is a safe and effective procedure that uses HA fillers to shape, define, and smooth the patient’s nose.The procedure is done by our spa’s nurse injector and takes about 20 to 45 minutes to complete with no downtime. Non-Surgical Rhinoplasty services can correct many issues people have with their noses or be a temporary correction for those considering rhinoplasty. 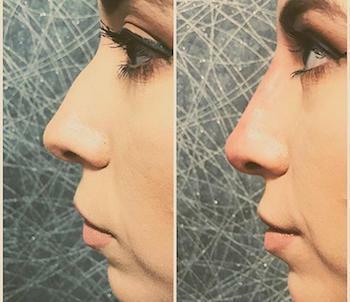 This procedure can not make the nose smaller, however, it is perfect for anyone who wishes to smooth or reduce the appearance of bumps on the nose, lift the tip of the nose, or create a more pronounced, symmetrical bridge.